THE MARTINI CHRONICLES: Martini Break!!! Greetings Divas and Gents! Once again, the weekend is upon us…and so is another tasty martini recipe. This week’s recipe incorporates one of my favorite fruits: the peach! I love peach cobbler, peach soda, canned peaches…all peaches everything! I am also a big fan of the Peach Bellini Martini. It’s sweet and sassy, and a little bit fizzy! It is definitely a crowd favorite. 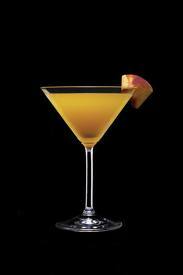 So…find a crowd, and hook them up with a Peach Bellini Martini! 1. In a shaker, combine Vodka, Champagne, Schnapps, and Ice. Shake! 2. Drop 2 peach slices in the bottom of a chilled martini glass. 4. Garnish with a peach slice. What did the crowd say? Drink Responsibly! I love your blog! I LOVE the purple color!